The Play & Learn Foundation brings together boys and girls who have a passion for play, a drive to lead, and a desire to pursue academic and professional excellence. By targeting underserved communities, PAL seeks to provide opportunity where it is most needed. Play & Learn engages youth in programming that encompasses football and sport training, academic support, mentorship, and community outreach. We do this by providing access to fun, safe, equipped spaces that are supported by committed tutors, coaches and mentors. Play & Learn works to empower our participants to pursue their passions and achieve their full potential. Founder and Executive Director Nana Kwesi Ohene conceived the idea for a combined academic and football programme in 2013, during his time as an MBA (Marketing) candidate at the University of Ghana Business School. A lifelong football fan and experienced coach, Mr. Ohene committed much of his down time as a graduate student to coaching, managing, and organizing a variety of football initiatives at the University's Ajax Park. During training sessions, Mr. Ohene began to develop relationships with the many children who would come to watch. Eventually, the children were permitted to train with the Girl's International Student football team. Over time, it became clear that these kids had a strong desire to play and came from communities where resources and opportunities were lacking (such as Okpongolo, Shiashie, Bawlashie and Madina). Many of these children come from homes that relied on their contribution to family income and in which they were the first to receive a basic education. After identifying a series of needs, in addition to a safe and fun space to play, Mr. Ohene and a group of dedicated supporters began to conceptualize what would, in 2015, become the Play & Learn Foundation. In its earliest stages, informal activities were held and covered a diverse range of lessons, from homework help to creative writing, time management to tolerance. Activities and lessons have since been formalized in order to maximize the benefits to the youth through more structured programming. Academic sessions focus on literacy and comprehension, while football training includes the nurturing of soft skills such as teamwork and discipline. Mentorship sessions focus on topics such as problem solving and goal setting, while community outreach activities teach tolerance and respect. Nana believes that one act of random kindness can go a long way to make the world a better place. To him, Play and Learn embodies everything good about humanity & the need to be each other's keeper. Michelle is a researcher at a News Analytics Company in the South of Spain. She assists with everything that has to do with writing. Jeffrey is a graduate from Depauw University, where he majored in Economics with a background in Finance and Banking. He is currently applying for grad school. George is a Communications Specialist with expertise in communications strategy development, media management, branding & training. Menbereselassie is a graduate of Tufts University in Medford, Massachusetts (Bachelor of Arts in Community Health and Africana Studies). Vanessa works with the national social security company (SSNIT). She has a love for children who need her the most, hence her involvement with the Play and Learn Foundation. Bismark is studying at the University of Brighton working towards his MSc. in Tourism & International Development. He is passionate about community development and tourism. Dorcas works as a Human Resource Advisor in Ghana's public sector. She predominantly assists the Play and Learn Foundation with fundraising initiatives and other support where needed. Nana serves as a Financial Reporting Accountant for the non-profit National Public Radio. She also works with PAL on finance and accounts. Dominique is a young Canadian development practitioner with varied field experience. Her areas of focus include program management and coordination, as well as organizational growth and development. In order to facilitate fundraising and volunteer mobilization globally, Play & Learn entities are being established in several countries. To date, Play & Learn sister organizations have been registered in the USA and Norway, while registration in Canada is currently underway. Play and Learn Foundation, Incorporated (USA) was established in 2017 to support the mission of the Play and Learn Foundation in Accra, Ghana. Play and Learn Foundation Incorporated’s main purpose is to raise funds and solicit donations in order to provide materials and equipment for the athletics and academics program; to support the recruitment and organization of volunteers for coaching and tutoring programs and to help with the development of curriculums. In addition it provides organizational structure and monitoring programs in support of the growth of the Play and Learn Foundation in Ghana. Play and Learn Foundation, Incorporated (USA) is a Maryland Private Foundation, recognized as tax exempt under Section 501(c)(3) of the United States Internal Revenue Code. Contributions to this entity are therefore tax deductible for American tax-payers; charitable receipts will be provided for all donations, beginning in 2018. Nana A. Owusu is a Finance & Accounting Professional with expertise in non-profit accounting and grants and compliance. She holds a Bachelor’s Degree in Business and Economics from Ursinus College, as well as a Master’s in Business Administration from American University in Washington, D.C. 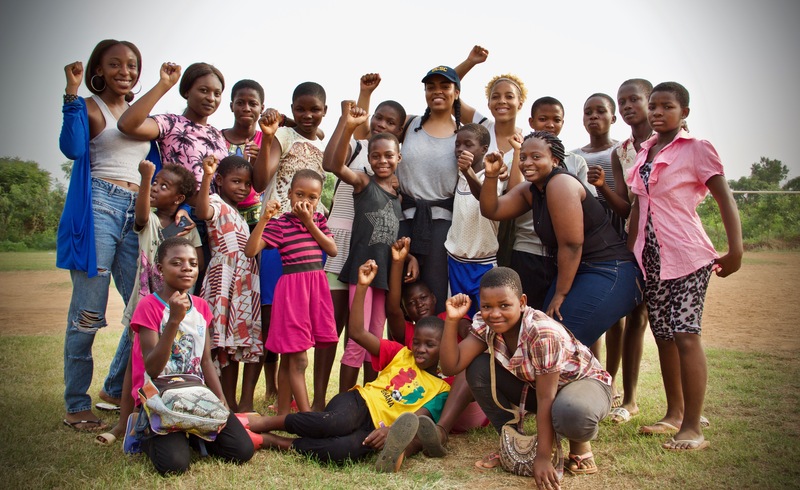 Her passion to learn more about her heritage and culture drew her to a study-abroad program in Ghana. Nana believes that Play and Learn Foundation is her way of providing equal opportunities and resources to those in need. Audrey is a passionate, decisive, strategic Product Innovator, Solution Architect and Program/Division Executive with extensive experience in Global Health and Population Health. She supports the non-profit sector with strategic plans development, messaging and outreaching programs, all for improved and widened fundraising opportunities and program efficiencies. She is an avid advocate for wildlife and environmental issues and uses her wildlife photography as mean to give them a voice. Karissa lives in Jackson, Mississippi, where she works in childcare, as well as at a restaurant. Menbereselassie is a graduate of Tufts University in Medford, Massachusetts (Bachelor of Arts in Community Health and Africana Studies). Her areas of specialization include global development, public health and operations management. Isaac has been an Ambassador for PAL since 2016. He is currently the head of business intelligence for REV Group, responsible for guiding its corporate strategy and business development. Prior to this role, Isaac spent nearly 8 years at Caterpillar Inc. in several lead roles across its Commercial and Finance divisions. Isaac lives in Miami, Florida, with his wife and daughter. His passion for working with NGOs stems from his commitment to improving quality of life for people around the world, specifically children. Nana believes that one act of random kindness can go a long way to make the world a better place. To him, Play and Learn embodies everything good about humanity & the need to be each other's keeper. Nana is the founder and Executive Director of PAL Ghana. Bill is the Director of multiple Commercial Service offices of the U.S. Department of Commerce and Executive Secretariat of the Virginia and Washington, DC District Export Council (DEC). Bill’s regional expertise is in Sub-Saharan Africa. Prior or to the Department of Commerce, Bill worked with several Africa-focused firms and overseas agencies, including USAID, the World Bank, and Peace Corps. Antwaun is a strategic thinker and executive with extensive experience in international trade, government affairs and political operations. Prior to founding Penn & Broad Partners, Antwaun served as a Presidentially-appointed Deputy Assistant Secretary of Commerce at the International Trade Administration (ITA). Before joining the ITA, he served as Senior Advisor at the U.S. Small Business Administration (SBA). Earlier in his career, Antwaun spent over 10 years working as a Washington, DC-based political consultant. Alex is the founder and owner of Seed Social and Creative, a brand management and creative agency based out of Denver, Colorado. He lends his services to several global non-profit organizations in brand development and marketing strategy. Niisha is the CEO and Founder of We Global Arts Festival, LLC. She has over fourteen years of experience and a comprehensive background in Corporate Law, Entertainment Law, Youth Advocacy and working with non-profit organizations. Brenna works with a local business in Oakland California. She plans to visit Ghana again soon. For Brenna, meeting and working with the PAL kids is the most enjoyable and fulfilling thing about contributing to the organization. Pablo studied film at San Francisco State University. He supports PAL through the creation of media content. Currently living in Copenhagen, Denmark, studying history and working part-time as a journalist. Live took part in a semester abroad in Accra, Ghana in 2015, where she began her collaboration with PAL. Currently living in Bergen, studying to be a teacher. Works part time as a journalist. Currently living in Trondheim, working in a café. Mette studied geography and participated took a semester abroad in Accra, Ghana. PAL Norway was founded in February 2017 in Trondheim, Norway. The organization aims to spread information about the Play & Learn Foundation to students considering an exchange semester in Ghana, and to engage Norwegians in funding campaigns aimed at improving the life of children in Ghana through PAL programming. Play and Learn Norge is registered as a non-governmental organization (NGO). Contributions to this entity are therefore tax deductible for Norwegian citizens; charitable receipts will be provided for all donations, beginning in 2018. Lloyd is Strategic Occupancy Planner for real estate firm Jones Lang LaSalle. He lives in Manchester, U.K.
Taylor is a medical student at Rocky Vista University in Colorado, U.S.
Megan attends Simon Fraser University, where she majors in Int’l Studies, with a focus in conflict & reconciliation, and a minor in Dev’t and Sustainability. She also works as a program coordinator with indigenous youth. Amina studies at Seattle University and is pursuing a degree in Journalism and Criminal Justice. Henrike is a graduate student at Linnaeus University in Sweden. Lina is a Senior Pre-Med student at the University of California in the U.S.
Makida studies at the University of Denver and is majoring in Finance and International Business. Jeanette is a student at DePauw University in Greencastle, Indiana. Emma studies mechanical engineering at California Polytechnic. She is passionate about sustainable development. Abigail is a law student at the University of Illinois College with a focus on litigation. Jessica is a PhD student at the University of Paris, where she studies political economics. Samiyah is a senior student at the University of Central Florida majoring in Business Management. Salma is currently studying Cellular and Molecular Biology at Seattle University. Ijeoma Ejiogu lives in New York City and is a recent graduate of Tufts University. Cole studies geology at Montana State University. He also works as a white-water rafting guide. Maggie is currently finishing her last year of University studying Physical Therapy. Ghanaian born Erika Opoku is currently pursuing a Doctorate in Physical Therapy in New York City. Born and raised in China, currently pursuing a degree at New York University and making art in New York.